Back in the good old days, Alaska was known for its Gold Rush. Times have changed and now the big news from up north is the revered “Copper Rush.” A few days ago my husband Gerry and our Chef Jeremy dashed up to Cordova, Alaska, to be on hand for the catch of the first Copper River wild salmon. The “rush” to get the first “copper” back to the lower 48 is a big one. These brave explorers were successful and brought some gorgeous sockeye and king back to Salty’s for the first taste of the season. Let me tell you the texture and flavor of that highly prized fish was absolutely divine. So where on a piece of salmon is this highly prized fat deposited? Did you know that the grey layer of flesh between the skin of the salmon and the pink muscle is actually where the vast majority of this nutritious fat is stored? Many people unknowingly scrape this delicate part off. Don’t do it! Be sure to dig into the grey fat layer of your salmon in order to mine the highest nutritional benefit. Beyond good personal health the Copper River fishery is also about environmental health and sustainability. Sustainable fisheries are actively managed to maintain a steady healthy population of fish and are critical in preventing a decline in numbers over time. In order to accomplish this, yearly fishing quotas are established, preservation of vital areas of the rivers are maintained, monitoring of migration numbers are counted and spawning and reproduction levels are traced. This high level of stewardship is essential to the enduring quality of the Alaskan Copper Rush. At Salty’s we are “panning” the delicious, nutritious, sustainable Copper River Salmon for yo’u right now. Come in and stake your claim on the mother lode! 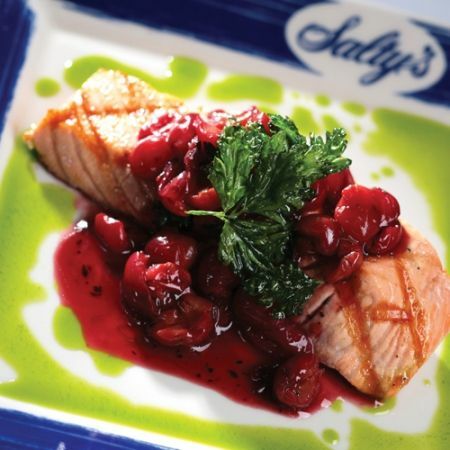 Click here for Salty’s Menus then make a reservation online or call us: Alki/Seattle 206-937-1600 | Redondo 253-946-0636 | Portland 503-288-4444.